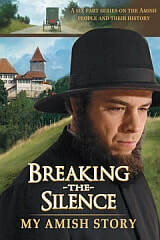 Breaking the Silence is a six-part documentary series that presents a respectfully honest view of the origins and legacy of the Amish faith, tracing the Graber family and the Amish church back to the Reformation Era. I was the 1st AD for the Amish reenactment shoot. In The Amish and the Reformation, host Joseph Graber, a former member of the Amish Church, traces his family history back to the Reformation era and gives unique insights into how Amish beliefs have changed over the centuries. I was the 1st AD for the reenactments.